Last August Zara factories were busted for slave-like working conditions for undocumented workers from Peru and Bolivia; now there's an in-depth look at the La Coruña, Galicia headquarters of Inditex, the company that owns the fast-fashion brand. An Istanbul-based writer went inside the Zara and Zara Home warehouses with communications director Jesus Echevarría as her tour guide. 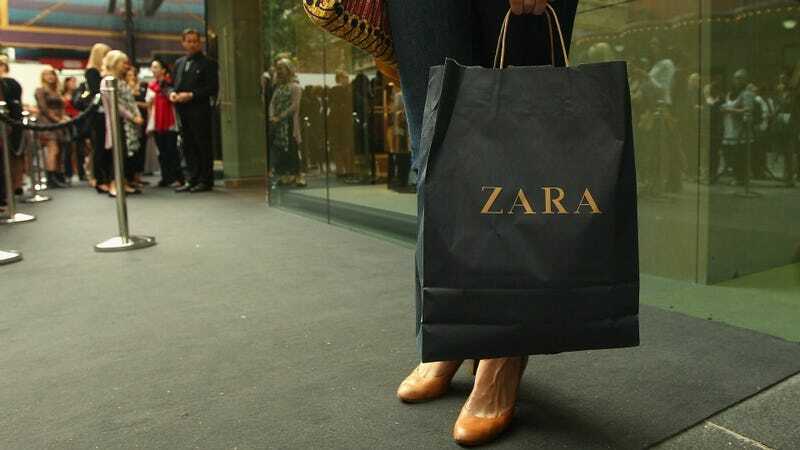 Although Zara (which began as a housecoat store in Galicia called "Zorba") currently has 5,900 stores in 85 countries, this grows exponentially as Inditex opens more than one store a day. Zara is leading far and away from competitors H&M, Mango and Topshop, and anyone who's shopped there knows that the turnover rate of their merchandise is unreal. Their success is based heavily on fact that you can't think about it, come back after lunch and buy it later. It's only, say, $15 bucks for a t-shirt, so you figure you may as well just buy it now. Store managers are trained to take note of customer's specific reactions to items ("I hate zippers at the ankles," is one cited example) and report back to headquarters in order to have new designs drawn up accordingly as well as more items in the most desirable fabric, color, or style shipped to the store within three weeks. Unlike the high-end campaigns at competing retailers like H&M, Zara doesn't do special luxury collabs with designers. A fashion consultant says that this is because "Prada wants to be next to Gucci, Gucci wants to be next to Prada. The retail strategy for luxury brands is to try to keep as far away from the likes of Zara. Zara's strategy is to get as close to them as possible." He also says that the more frequent release of collections from labels like Gucci and Prada (from two to four or six a year) is "absolutely because of Zara." Additionally, given the current sartorial reigns of the likes of the Middletons—Miss Selfridge and Topshop fans—financially accessible fashion is in vogue right now more than ever. A line of women stood at ironing boards, smoothing out the wool-blend, looking for defects and, the spokeswoman told me with emphasis, attaching security tags. Inditex had discovered that if that task was left to the employees in the stores, it would take an extra few intolerable hours to get that trendy red coat from Galicia into your closet.